The old codgers finally got back to winning ways against a youthful (only by comparison) MK C team. Richard McMorran was the first to finish. Having seen off Colin Solloway quickly when Colin played for Open University in our last match he drove a massive pawn wedge into Colin’s Kingside. It seemed that every square near the King was occupied by a piece of one or other colour. 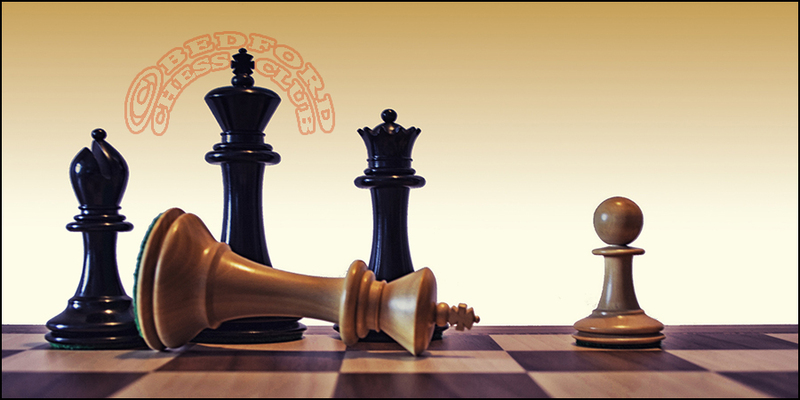 The King may have been very cosy but Richard fooled him by checkmating the Queen instead. I’m not sure which of Tony Lawrence and I finished next. Tony got off to a good enough start against end game specialist John McKeon but in a major piece ending slowly leaked pawns. If only we could adopt the rugby practice of having finishers (aka substitutes) to finish off Tony’s good positions. I expected Alan Heath to play the Petroff but had not previously seen black’s Nc6 on move 3, giving up a pawn for an early, vicious, Kingside assault. I accepted a Knight sac on h2 to go a whole piece up but lost my nerve and unnecessarily returned the material and more to go into a Bishop and pawn ending a pawn down. I managed to draw only because the extra pawn was too impatient to reach my back rank, and died in the attempt – see game below. All eyes turned to Joe Valerio’s game against Dave Wells. Clearly I need new glasses as it appeared that Joe was ahead on time. Obviously this couldn’t be true but it didn’t matter. Each player had a rook and a minor piece and Dave offered to exchange rooks leaving his knight undefended, an offer which after a surprising amount of thought Joe gratefully accepted. So we had at least a draw. When I last saw his game against Gier Erik Nielsen Robert Walker looked better with a good Knight against a poor Bishop, but had lost the exchange since I last looked. Both captains managed to make to clear made it clear what was required! Robert conjured up some nasty threats which got Geir’s rooks into a tangle and he had to settle for a draw. This was our third match and our first victory but what matters now is our next against our D team, who romped to a 4.5 to O.5 win in our first fixture. Bring it on whippersnappers!